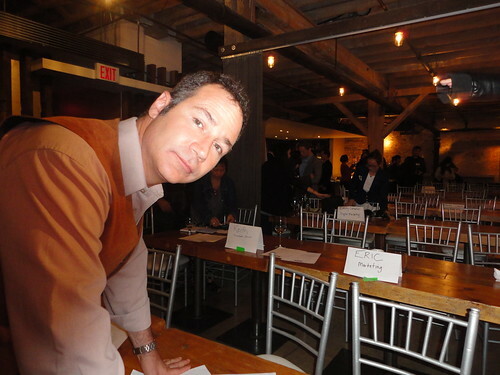 Search and Social Rank Symposium Five occurred on a Tues 15th October 2013 and ran from 6 to 10 pm in the event space above 18 Tank House Lane; the Boiler House Loft venue in the Distillery District hosted Search and Social Rank Symposium Five. The sandblasted wood, post-on-beam space is historic; the brass encrusted oak bar is a magnificent granite surfaced masterpiece from the last century. 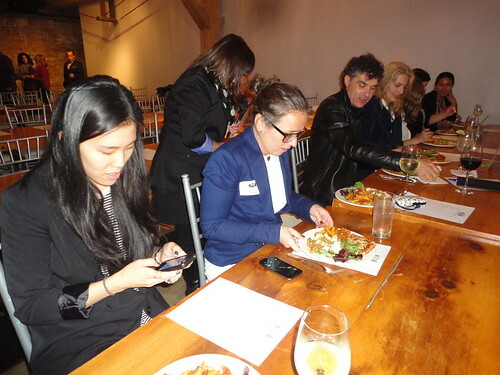 The cozy event space enveloped all sixty five guests in comfort and splendor, and the sound quality of the rectangular room is remarkable considering it’s situated directly above one of the busiest kitchens in Toronto. The Boiler House Loft is directly above El Catrin restaurant, but has its own entrance. Here’s Brian Rotsztein beside the lovely signage made fresh by the gang at Jib Strategic, their offices are two buildings south on Trinity St, also in the Distillery District. The fifth symposium was a huge success and sixty four participants soaked up paradigm shifting tips and tactics generously shared by some well polished speakers. Each presenter addressed some aspect of Search Engine Optimization SEO, and Social Media Optimization SMO and the relationship between these two seemingly disparate but increasingly connected marketing disciplines. 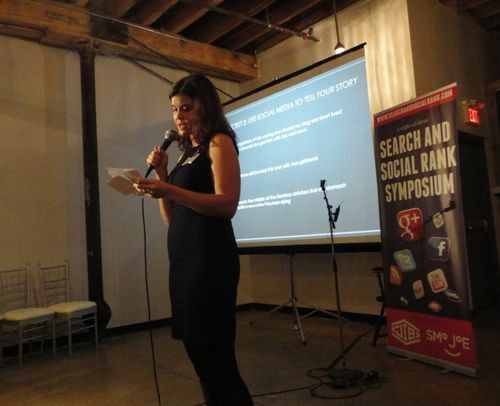 The interesting concept of measuring and promoting a company’s ‘search and social rank’ is what inspired the first symposium, three years ago in a different location (but still a Toronto City Events production, with Deb Lewis being Chief Experience Officer of each Search and Social Rank Symposium. 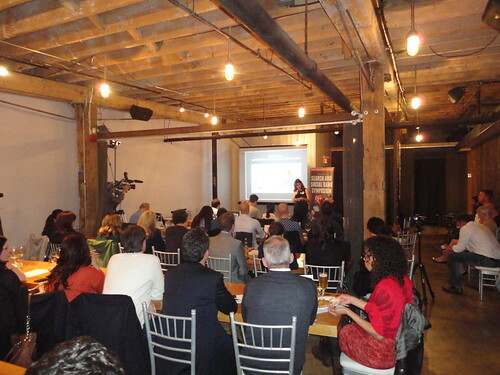 On the 14th of November 2011, the first ever Search and Social Rank Symposium occurred in The Cannery which is located at the back of #9 Trinity. 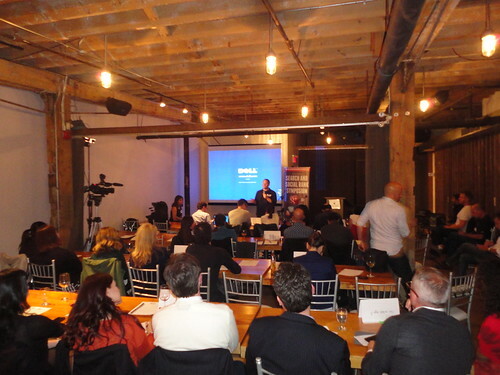 On that historic evening four speakers delivered presentations on various topics pertaining to seach engine marketing, Yahoo, Facebook and YouTube along with local search, mobile search, video and image searches. The experts discussed how they’re being more and more affected by social media with particular emphasis on which social signals can have the most effect on which platforms. All succeeding symposiums have focused on the same theme, namely How is the future of search going to affect my company’s findablility? The $20 ticket included a buffet dinner and drink, and probably because of the great reputation of El Catrin below, people showed up early to ensure they feasted on poutine, salad, pizza and tomato beef pasta. Getting there early also ensured they would be getting good seats up front and indeed the space filled up quickly from front to back; as attendees finished their meals their tables were cleared of empty dishes by attentive staff. The wireless password was posted at the door, and the #SSRS5 was the event hashtag made public (you can still do a Twitter search if you wish to connect with the attendees). After dinner, many folks opened their laptops and tweeted quotes and pictures from the proceedings. According to Tweetreach, the sixty people sitting in the Boiler Room that night had the potential to impact 100,000 people. Deb Lewis, from Toronto City Events introduced the speakers. Rob Campbell was introduced by Deb Lewis and she mentioned how Rob recruits the other speakers from among his most interesting friends and acquaintances. Rob spoke first on How To Do Content Marketing For SEO? Rob’s rather crude but effective five slide PowerPoint nicely introduced the sophisticated concept of a search and social ranking in the Google search algorithm. He defined both concepts and set about pinpointing the parameters of each practice. 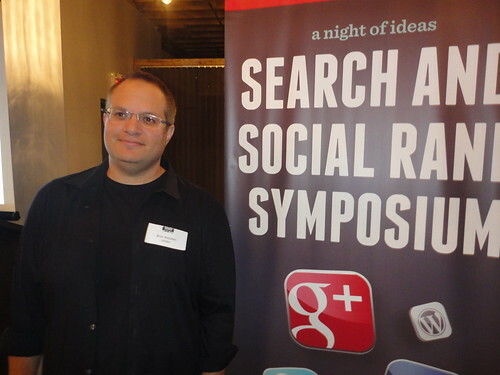 Search and Social Media Rank Symposium 5, Rob Campbell, “Rank 1st on Google”, October 15, 2013 from Peter Mykusz on Vimeo. In particular Rob focused on the challenge of getting incoming links to any website that are juiced up with social signals. First, it ís not easy getting quality links and second, how do you make people share them so they have a social weight? The answer is; good storytelling across multiple platforms with links embedded in keyword rich messages. Rob Campbell relayed some very interesting insights like, ì…today a digitally savvy ad agency is better positioned to do SEO than an SEO company, because the ad agency has something to say.î A marketing company has a budget to make attractions, web events, videos, blogs, even digital coupons can precipitate sharing … an SEO company doesn’t have many genuine relevance building tools. The ad agency has stories to tell, while the SEO company probably doesn’t do much storytelling – its not in the budget! To everyone’s express delight, Rob shared key insights into his own storytelling process including link sources wherein attendees can get links for themselves, and their own companies. 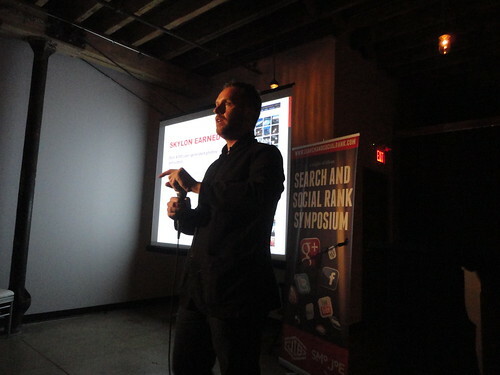 One of the most interesting things about Rob’s opening presentation was how he referenced many of the websites wherein he put ads for the Search ad Social Rank Symposium. These are some of the best places for attendees to start putting their messages today; these public forums and free blogs have high tolerance from moderators and yet are busy enough they accrue a high page authority for links in posts. Smart Canucks Discuss Search and Social Rank Symposium Smart Canucks herein are having a good discussion about #SSRS5 and you can too. This is a very good place to have a discussion about anything related to the Canadian online experience. Free Ads Planet discusses Search and Social Rank Symposium V Free Ads Planet discusses Search and Social Rank Symposium V. Free Ads Planet . com is the little site that could. Duzee / Price Network Discussion on Search & Social Rank Symposium 5 in Toronto Duzee is what remains of what used to be Price Network. 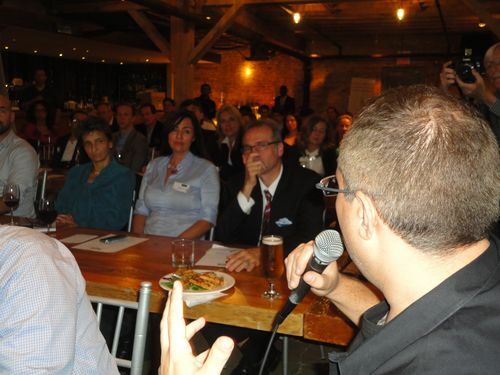 This is the Price Network discussion forum thread on Search & Social Rank Symposium Five in Toronto. First read Deb Lewis blog about #SSRS5. Deb Lewis is the event producer and she has a popular blog showcasing her best work promoting Search & Social Rank Symposium Five. 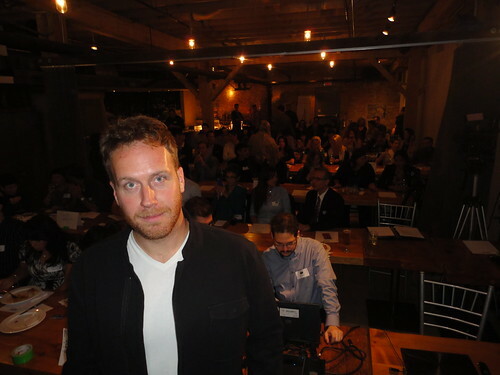 Rotsztein gave an interesting talk on using Videos for SEO; Brian is the CEO of a SEO web marketing company in Montreal, and President of the Canadian Internet Marketing Association. Brian had people laughing when he said ìEvery time you make a bad video, a puppy dies.î Projecting the image on screen of two cute and cuddly puppies, he discussed the importance of only putting out high quality videos. One of the more interesting things that Brian did was show how video of How-To topics does indeed appear top choice in search results. I regret that he elected not to give basic tips on how to rank higher with videos, which he skipped over saying ìI don’t have time to discuss making video sitemaps and other techniques for ranking higher in YouTube.î Brian wrote about SSRS5 on Purposive Blog, Search and Social Rank Symposium V in Toronto wherein he discusses his trip to Toronto. Search and Social Media Rank Symposium 5, Brian Rotsztein, “How to use Web Videos to Increase Ranking on Google”, Oct. 15, 2013 from Peter Mykusz on Vimeo. Brian Rotsztein met with David Shephard before the event discussing WordPress solutions and they managed to talk about the best ecommerce plugins for SEO which is a very controversial subject because it seems like everyone has their own favourite solution. Jennifer Balogh shared good tips and tactics for how to make email marketing campaigns more effective in am increasingly social world. 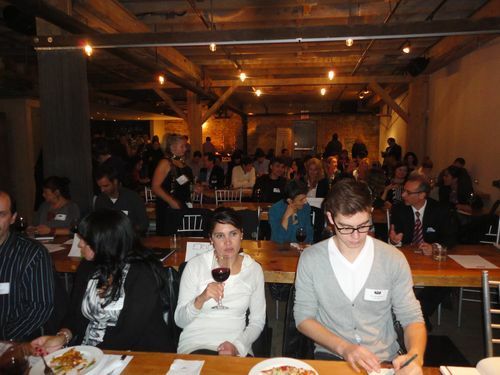 There were a lot of people taking notes when Jennifer Balogh, a Senior Account Manager of email marketing at Vigorate Digital was sharing her secrets. She started strong by getting everyone really excited by showing econsultancy stats that illustrate how email marketing is still quite efficient today, and perhaps more cost effective than ever before. Search and Social Media Rank Symposium 5, Jennifer Balogh, “Email Marketing in a Social World”, Oct. 15, 2013 from Peter Mykusz on Vimeo. In a wonder-filled presentation entitled Email Marketing in a Social World, Jen’s presentation focused on trust building techniques and ways to shape impressions inside the email experience to promote social expressions and build corporate SMM profiles and of course encourage people to visit websites and populate email subscriber lists. Upon concluding her speech and after some applause, Jen took questions. Her first query from John Conn of Standard Tele had her quickly defining ‘permission based email’ campaigns. So Rob Campbell did his job as moderator and made things more interesting when he asked Deb to reveal her monthly email newsletter open rate… and she stated that it was 20% !! (and there was a collective gasp) Twenty percent open rate is really good… really, really good. In my experience a company is happy when they have a three percent (3%) open rate. The Contest Queen whispered in her neighbor’s ear that she once had her newsletter open rate up as high as 50%, and the man’s eyes widened in disbelief… But its true, her subscribers are always looking for the inside dirt on free -to-enter and win contests. 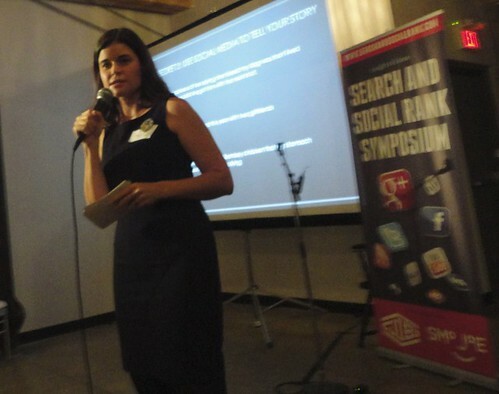 Search and Social Media Rank Symposium 5, Nikki Fotheringham, “Five Secrets to Brand Storytelling”, October 15, 2013 from Peter Mykusz on Vimeo. Nikki shared five common sense tips for building traffic and authority for your website. Geoff Whitlock the President of Surround Integrated Marketing was a great closer! As the high energy CEO, Geoff Whitlock has build infrastructure and publishing networks and media creation and promotion rituals to create a robust Surround Content Marketing Strategy that reflects his ideological perspective, his web P.O.E.Try and three phase integrated marketing regime. Geoff Whitlock discussed the inter-dimensional relationship between Paid Media, Owned Media and how it works to create Earned Media and make POEMs. Search and Social Media Rank Symposium 5, Geoff Whitlock, “POEMS, Paid, Earned and Owned Media”, Oct. 15, 2013 from Peter Mykusz on Vimeo. 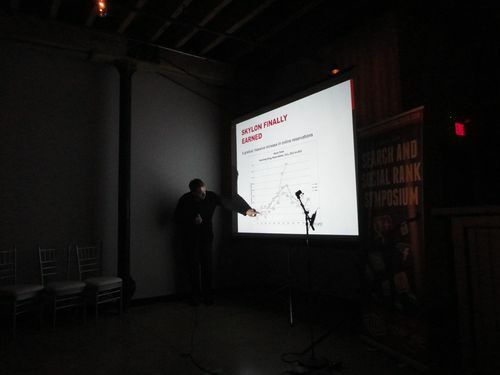 To hammer the concept home, Geoff let the audience look at one of his client’s performance charts in accordance with the various and different marketing levers pulled at different times for different reasons inside coordinated or as we say integrated web marketing strategy.